Until recently, my life has been completely consumed by exams and coursework so my inner bookworm has had to be buried for a while. This means that my poor bookshelf is practically crying out for attention. Even though I wasn't reading I was still buying more and more books, so my "To-Read" pile is now almost taking over my room. Now that the dreaded exam period is over I'm really looking forward to having a few months where I can truly read for pleasure without having to try and cast aside the "I really should be revising" feeling. This means that I can begin to tackle the monster book pile, and I couldn't be more excited as there are so many little gems hidden within it. 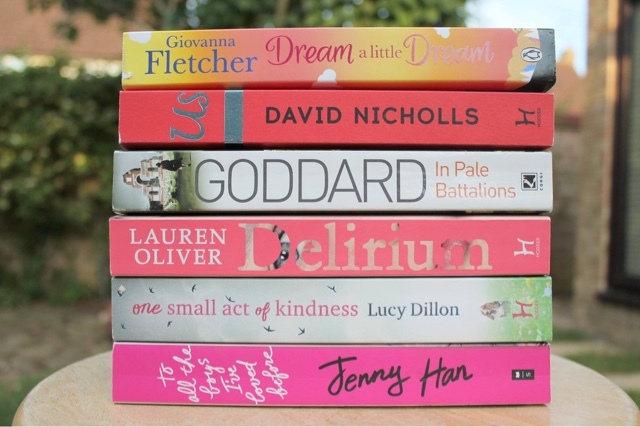 At the top of my list comes Dream A Little Dream by Giovanna Fletcher. Giovanna is very quickly becoming my favourite author so I'm ever so excited to be able to read her latest romantic beauty. I'll put my hands up and admit, I did purchase her first novel Billy and Me simply because she was the wife of Tom from McFly, but I soon fell in love with her writing style. I adored her second novel You're The One That I Want even more, so I've been practically counting down the days until Dream A Little Dream hit the shelves. Although I haven't been able to get my nose into it yet (it's next on my list; I promise) the plot sounds so incredibly inviting and I know I'm just going to love it. This is followed by Us by David Nicholls. Ever since I read - and fell in love with - One Day late last year, I've been eyeing this book up so I couldn't resist treating myself to it when I saw it for sale at Tesco for £3.85. What a bargain. I'll share a secret with you... I'm a bit of a (huge) history geek. Although history may not currently be my strongest subject at school, as the style of essays you have to do at A Level aren't really my thing, I'm a sucker for a good history book. One of the areas of history that fascinates me the most is the early twentieth century, in particular the two world wars, so In Pale Battalions by Robert Goddard is right up my street. The story centres around the Thiepval Monument in the Somme battlefields in France, which excites me ever so much as I actually visited the monument a few years back. I know Goddard read History at Cambridge before becoming an author, so I'm expecting a wonderful case of history meets thriller. Delirium by Lauren Oliver is very much a right of passage for all young female book worms. I remember reading it when I was about thirteen and it had just hit the shelves but since then my copy has just been gathering dust on my bookshelf. When browsing the Young Adult shelves in Waterstones not too long ago, I came across the second and third books in the trilogy "Pandemonium" and "Requiem". I'll be honest, I had no idea these books even existed but - having been rather unsatisfied with the ending of Delirium - I'm rather excited that they do. My plans are to delve back into book number one before I treat myself to the sequels, just to re-familiarise myself with the story. I've been on the look out for a good new feel-good book for a long while, and I think One Small Act Of Kindness by Lucy Dillon will fit the bill perfectly. This is the first title I've read by the author but if the Goodreads ratings are anything to go by, I'm sure I'll love it. To finish things off, To All The Boys I've Loved Before by Jenny Han is the book that has just reached by bedside table. This seems to have had mixed reviews from the bookworm world but so far I'm rather loving it. Contemporary Romance YA novels are my one true book love so any title that fits into the genre as well as this one does is bound to be right up my street. Have you seen any books amongst my little list that you'd particularly like to see a review of? Which books are currently on your to-read list? Delirium is a good book! I really want to read Us and Dream A Little Dream! I haven't heard of In Plain Battalions but it sounds interesting.